It's been a big party weekend for my family, so let the festivities continue with a yummy treat from childhood, chocolate rice krispie treats. These aren't rice krispies held together with a dash of weak chocolate. These are more melted chocolate with rice krispies. They are super rich, so they are mini-sized. A great party item and a sweet homemade gift for your favorite chocolate lover! Melt the chocolate by setting a glass bowl at the top of a saucepan filled with a little water. (The water shouldn't touch the bottom of the bowl). Heat the water and place the chocolate into the glass bowl. Stir as the chocolate as it melts. Place your rice krispies in a mixing bowl. 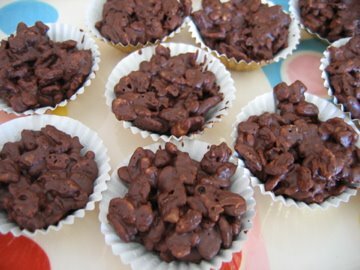 When the chocolate is completely melted, pour it over the rice krispies and stir until all the krispies are well-coated. Allow the mixture to cool. Place mini paper cups into mini muffin tin. Using two spoons, carefully spoon the mixture into the paper cups (makes 24). Once the mixture is distributed, go back and press down on the top of the treats with the back of the spoon to compress them a little and ensure they hold together well. Cover with a piece of parchment paper and put the entire tray in the fridge until set (at least 1 hour). aw - that does remind me of choldhood birthday parties big time. yum. Squeal! These are the rice krispy treats that I grew up with! What a lovely post! The last time I made these, I rolled them out thinly and cut them into squares, then put a frozen parfait on top. But somehow, seeing them in papers like this makes me very nostalgic! Tejal, you and Glyn told me that you crazy UKers made rice krispie treats with chocolate, and I guess I believed you, but it's nice to have proof. And I used to buy Mars bars here all the time. Then they disappeared for a while, but now I think they're closer to the Snickers with almonds than to a 3 Musketeers. I had the same reaction when I heard Americans used marshmallows! Mars bars have fluffy nougart and rich caramel inside, but no nuts. So its similar to a milky way (not 3 Musketeers). I'm fixing it in the post.